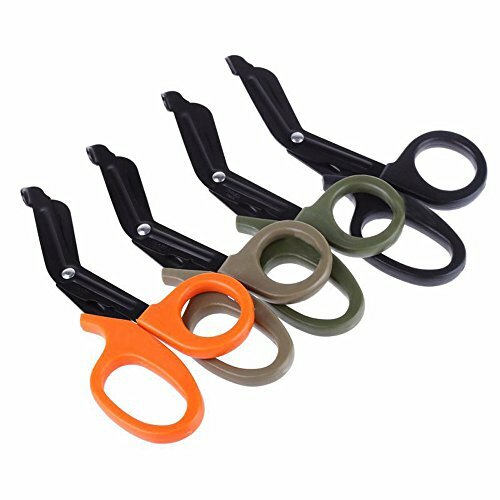 Ezyoutdoor 4 Pieces EDC Rescue Bandage Scissor Multi-function Stainless Steel Shear Outdoor First Aid Shears with Tough Plastic Handle by ezyoutdoor at Kerinci. MPN: EZY000824. Hurry! Limited time offer. Offer valid only while supplies last. Description: During an emergent situation, every second is vitally important. A multi-functional bandage scissor can do you a great favor. During an emergent situation, every second is vitally important. A multi-functional bandage scissor can do you a great favor. Ergonomically designed, one side of blade has fine tooth for anti slip and easier cutting, while curved blade would not cut patients. Perfect for nurses, doctors and emergency medical technicians, and you can also keep one for emergency and outdoor usage, too. Heavy duty style shears for EMT / paramedic, emergency medical technicians, nurses and doctors for every day trauma use. Use for cutting tape or bandage. Can rip through jeans, heavy jackets, multiple layer clothes and sweatshirts. Sharp and durable, curved blade would not cut patients. Thick and sturdy for maximum support and grip.